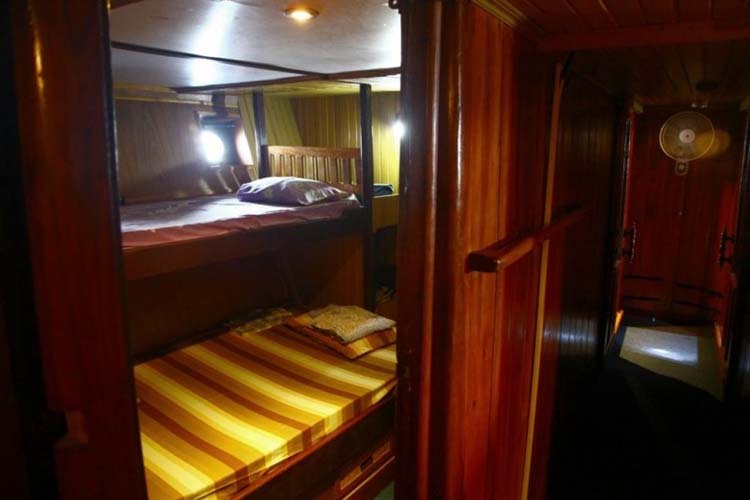 Welcome on board to the MIKUMBA Ratu Laut liveaboard! Sailing the seas of Indonesia since 2008 as a surfing charter boat, for the first time our boat now serves as a dive boat! MIKUMBA Ratu Laut has traveled to the island of Nias, Sumatra, and other places across Indonesia and has taken bold surfers to some of Indonesia’s most challenging surfing spots. The boat itself is a type of Indonesian legendary boats, the Phinisi, but equipped with modern facilities and single engine. 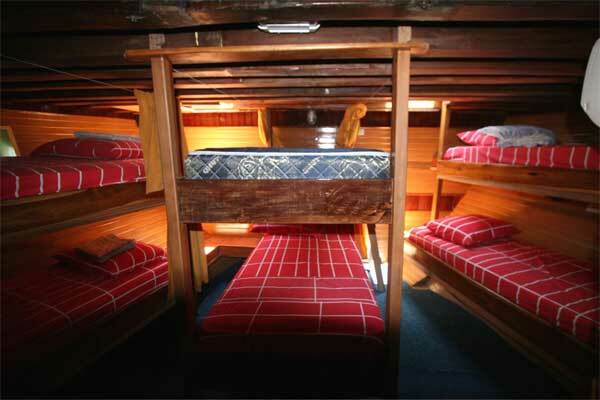 It has three neat cabins and one open cabin comfortable for up to ten people, with a cozy dining space. An exciting on board living at affordable price! 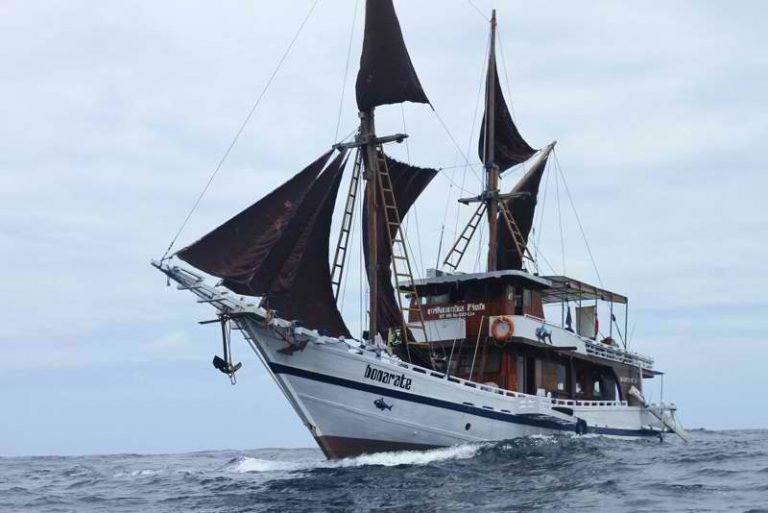 MIKUMBA Ratu Laut takes adventurous divers cruising through spectacular scuba diving paradises, such as Raja Ampat, Ambon, banda sea, After the high season we will change location and to take her to the crazy currents of Komodo National Park. Every time we moor up the boat around an island and we go for diving, we’ll encounter a very stunning and healthy coral reef, ridiculous amount of colorful fishes, graceful mantas, and majestic sharks. Not to mention the endegered sea turtles and hundreds of brightly colored nudibranchs that you may encounter. OBS! These trips we will be looking for strong current on several dive sites to get the action with sharks, tunas and big school of huge spanish mackerel that are the same size as the white tip shark. So we expect you to be a competent diver with good health condition to dive these sites. Internationally acclaimed as a piece of diving paradise in the world, Raja Ampat presents the most biodiverse underwater place on earth. In 2012, Dr. Gerry Allen smashed his world record with 374 fish species, counted during his single diving here. Schools of barracuda, jackfish, batfish, and snapper coexist here alongside with small reef fish, rays, sharks, turtles, and groupers. All these stunning sea creatures, as well as the coral itself, are out-of-this-world splendor. The very reason why we put this diving destination on the top of the list. You can charter the boat for your diving group or book a seat on the boat individually on MIKUMBA Ratu Laut. Your trips will be colored with snorkeling, diving, beach walks, and delicious food along the week. The Swedish Cruise director ensures your trip is handled professionally based on international sailing and safety standard. Plus, our crews are the bravest Indonesian sailor and boatmen, known for their ancestor who sail the seas, the Bugis. With only ten divers on boat, your diving trip to Raja Ampat will be a lot more exclusive and personal. You’ll have remarkable trips, not only due the fabulous diving sites to discover with its amazing underwater life diversities, but also the boat’s familiar, comfortable, and friendly atmosphere during your sea trip. To get the best possible diving experience, our cruise director will select the most convenient day to dive, based on the weather, currents, and tides condition. It’s essential part of your diving if you plan to have a safe and good diving experience. He will schedule 3 to 4 dives per day depending if you are doing a sunset or a night dive. 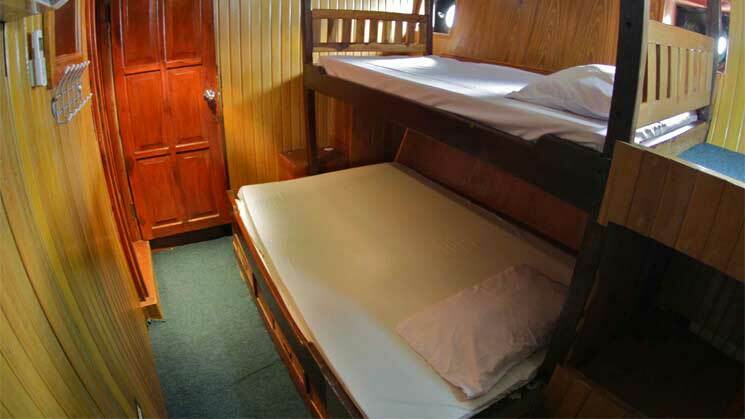 Ever wonder how your life on the MIKUMBA Ratu Laut boat will be? Here comes the illustration. The day you arrive we will do an check in. show you to your cabin. Set up your dive equipment. Sign some paperwork. The cruise director will introduce himself and rest of the crew. After that we will do a boat briefing and safety briefing we going to have a lunch around 15:00 after that we will be doing our briefing for our check dive. The following days you will start the day at 06.30 in the morning to have a quick breakfast with cereals with milk, and juice. A couple of minutes after you finish your first meal, you will have a briefing for your first dive. Once you are ready, you will get to interact with sharks, turtles, tunas maybe the majestic manta rays. At around 09.00, you’ll be back on the boat, ready for your real big breakfast and relax before a briefing for your second dive at 10.50. After your second dive, the lunch will be set on the boat for you around 12.30 to 13.00. You’ll have time to relax and rest before your third dive at 14.50. It is a good time to have a quick sleep or read a good book while enjoying some snack. 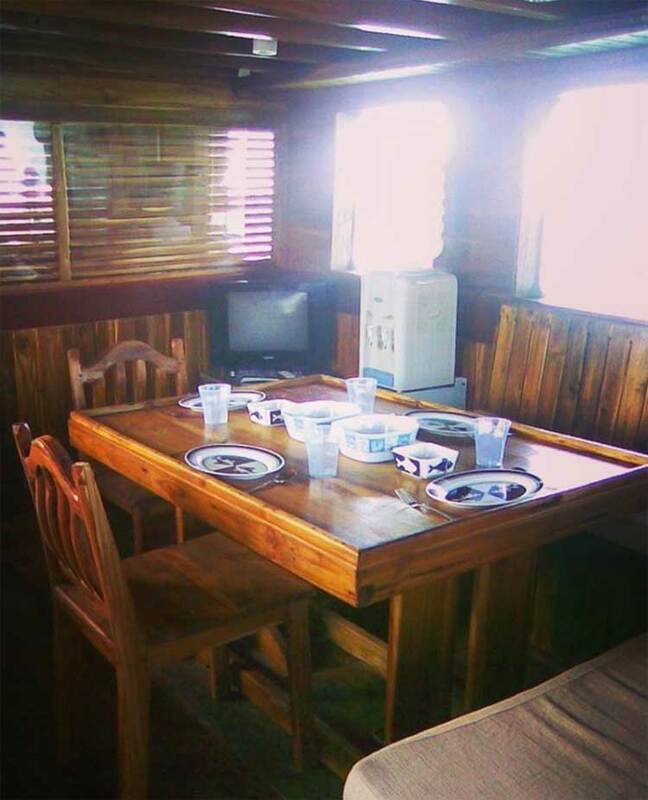 Otherwise, you can spend your time chatting with new friends while admiring the sea from the upper deck. Upon finishing your third dive, you’ll get time for snacks and another time to unwind, as well as preparing your camera for a sunset or night dive preceded by a briefing at 18.15. Dinner is served at around 20:30 if we are doing an night dive otherwise we serve dinner around19:30. On the boat, we serve Indonesian food and some western foods, as well as a plenty of local fruits for you. There will be no fish served on the boat, There is several reason for that, one is that is hard to find sustainable fish from the fish market in Sorong. The fish comes from bad places like dynamite, longline or trawling and we don’t wanna support that. The sustainable fish we can get from waisai or direct from the fishermans boats would not be enough for all guest so only the local crew will buy sustainable fish sometimes. On your last day on MIKUMBA Ratu Laut, we schedule 1 morning dives to let you have more no-fly time before we cruise back home. If the condition not allowed us to dive some dive sites, we will try to find a diving site alternative dive site for you to fulfill our diving schedule. Whatever happens, we always put your safety on the top of every diving activity that we do. MIKUMBA Ratu Laut will take you through an amazing journey within some of Indonesia’s most marvelous sea scapes. You’ll have a chance to dive through various diving conditions, from the calm current to the crazy current, from low tide to high tide. The archipelago surely keeps the world’s widest bio diversities of marine life. You can witness several kinds of sharks, pelagic schooling fish, Manta Ray, Dolphins, Pygmy Seahorses, Blue Ringed Octopus, and Frogfish. All those stunning sea creatures are circling around the massive amount of the remarkable, yet colorful corals. MIKUMBA Ratu Laut is run by excellent scuba diving team, each of the dive guide and diving instructor has been completed with SSI and PADI certificate. All crew members have detailed knowledge of Indonesian waters, marine species, as well as international safety, and protocol. Other dive support team members are true sailors with years experiences in sailing this vast archipelago, having knowledge on current and water condition. You can rest assure that if you sail with MIKUMBA Ratu Laut, you’ve got the most helpful and professional assistance from the best crew in Indonesia. At MIKUMBA, we are a little bit of current junkies and some dive site we will looking for strong current so when you sign up to dive with us be aware that we will try to find some strong current for some of the dive sites and that’s why we believe that diving in a smaller team will give you a better and more personal experience in current. That’s the reason why we only take four guest on one guide. If we want or need, we can make it even smaller. Being a small family on this boat, makes us more flexible when it comes to diving. We aim to hit the sites when the current and tides are right, sometimes we will make some changes to get the best of the dive sites. For some dive sites, there’s a need to wait until we get strong current. Sometimes falling tide or sometimes rising tide. If there’s no current, there’s no fish on these sites. 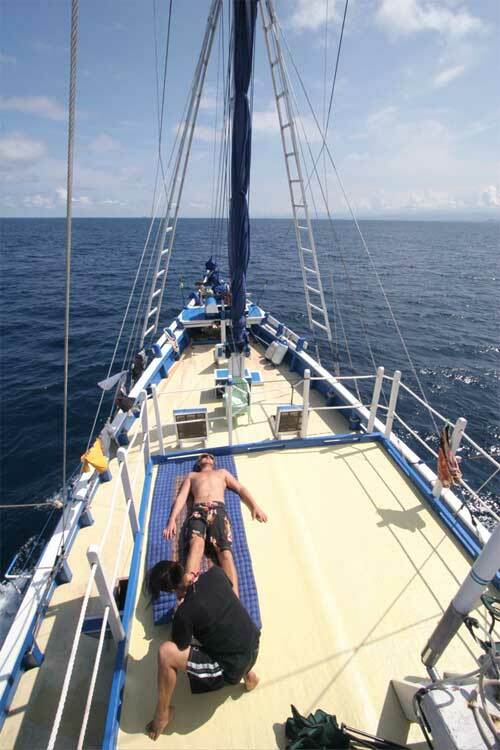 This flexibility is one of the benefits to dive with us on our boat Ratu Laut. MIKUMBA Ratu Laut offers a lot of space for divers and crews, yet it boasts seamless design that you can feel the adventure. 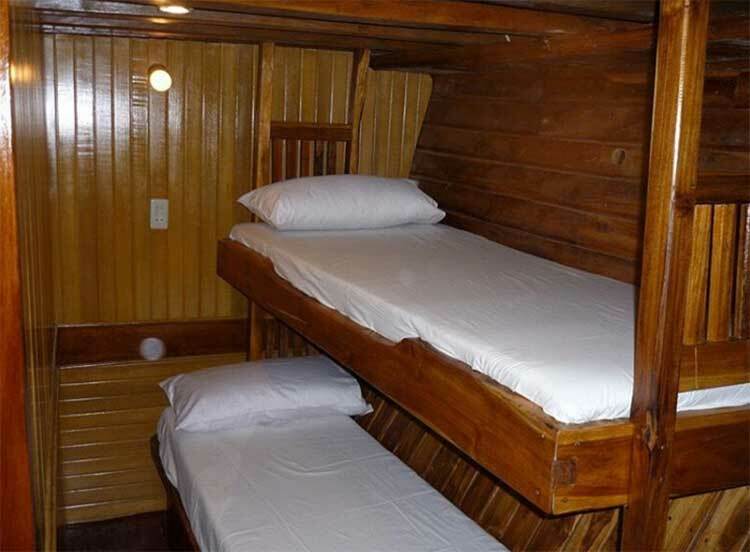 There are comfortable cabins and lots of space to unwind on the boat during the trip. The boat is equipped with modern tools and navigation, as well as international standard of safety. With experienced crew members, you’ll feel ease in mind while taking a journey with us. We are proud of our excellent service in accompanying guests in an amazing underwater exploration. We also offer some diving support, education, and coaching to ensure your underwater safety. Though, it is highly recommended for every diver to be competent and be in a fit condition. Since we are going through remote sailing route where the nearest help is far away, having a diving insurance is a must for you. Otherwise, we can’t allow you to dive for your own good. Your route trip to Raja Ampat will highly depend on the weather, currents, tides, and how busy the dive site is. MIKUMBA Ratu Laut cruise director will arrange the best possible diving experience for you and fulfill the itinerary. Should a change on the itinerary to be made while you are on board, we can just sit together and discuss the best option to be made thanks to the small number of divers on board. However, during an ideal day, here is a sample of diving itinerary plan to be done during your liveaboard with MIKUMBA Ratu Laut. Day 1, We will meet you up in Sorong and take you to the boat depends if it’s in Sorong or Waisai, If its in Waisai we will take the ferry. We are going to start doing our check dive on the island of Mansuar dive site called Yenbuba Jetty. Stunning dive site and very easy to dive and where you can see everything from mantas to pygmy seahorses. We will be staying in the bay between Mansuar and Kri Island over the night. Day 2, We move to the other side of Kri island and dive the famous chicken reef (Karang Ayam). It’s a submerge stunning reef and is good for big stuffs, like tunas, Spanish mackerel, grey reefs sharks, white/black tip reef sharks, wobbegong sharks, and big schools of fish. It’s best to dive in when it has current bringing lot of hunting action. On the second dive, we’ll move closer to the world famous cape Kri, where schools of barracuda, jackfish, batfish, snapper, small reef fish, rays, sharks, turtles, and groupers, as well as the coral itself, are out-of-this-world. For the third dive, we move to west of Mansuar to dive the Jetty of the Sawandarek village, a protected dive site with stunning reef and good for pygmy seahorses, nudibranches, common octopus, and wobbegong sharks. Just under the jetty we can see schools of jacks. Next, we move to the west part of Dampier Strait to visit Arborek Island, in the Dampier strait between Gam and Mansuar. We will visit barefoot conservation to get information on where the mantas is hanging out so we know where to go the next day. Day 3, We’ll only have about 15 minutes to manta sandy/manta ridge from Arborek Island. Manta sandy is one of the more famous manta dive sites in Raja Ampat, where you can see 4-5 mantas cleaned at the same time. We will dive manta ridge if the tide falls, to see a big amount of mantas hovering a couple of meters away, get fed by plankton carried by the strong current. We’re heading more west to Penemu and Fam Island aiming to dive the famous Melissa garden, you will see the best hard coral reef in Raja Ampat for sure. The site is named after the diving pioneer, Max Ammer’s daughter and is rich of underwater biodiversity: thousands of tiny reef fish, black tips, wobbegong sharks, pygmy seahorses, and much more. For the third dive, we move to Kerou Chanel which can be a great drift dive if we get a little bit of current. It features a very nice reef, huge sea fans, and wonderful soft corals which are very good for macro. Yet, some bigger stuffs can pass us out in the blue. Finally, we’ll trek to Bintan Lagoon viewpoint, after we are done we start do a 6-7h night crossing up to the north to Kawe Island, one of UNESCO’s world heritage sites. Day 4, We dive around Kawe Island, starting around the 3 famous island called Eagle Rock with their stunning reefs and, big fish soup, if you are lucky. The main reason to dive here is to see more Manta rays coming in to get cleaned in the cleaning stations around the rocks. On the second dive, we move over Black Rock, one of the best reef up in the north. It has nice soft coral reef and insane amount of different schooling fish, great for pygmy seahorses, turtles, black tip reef sharks. Going a bit deeper, we’ll see big marble rays and mantas can passing by in the shallow part. After the second dive, we move back to the eagle rock again. Normally, the current have changed by the time we get there and we can dive on different rock. After the third dive, we need to visit the village to get a permit before we mooring up inside the stunning Alyui Bay for a night dive at the famous pearl farm. Before diving here, prepare your camera and macro lens for a muck diving. The underwater view of Alyui Bay is arguably perfect for your macro and wide-angle lenses to capture diverse marine life like nowhere else. Day 5, We’ll go for another wonderful dive in Alyui Bay, starting the morning dive at chanel #5., a dive site with nice swim throws among the big rocks, big schools of sweetlips, and fusiliers. White tip sharks sleep under the big rock, and pygmy seahorses are here and there. Here, we can also encounter dolphins, so keep out looking for them upon going up to do a safety stop. Then, we move to Yangeffo Islands for our second dive which was an exploration dive for our cruise director, when he worked for his old company. The site was so good, a great mix of macro and bigger stuff, that make us keep coming since that moment. Getting a sloping reef down to 15 meter, continue drifting until hitting the sand area where you can see flamboyant cuttlefish, robust ghost pipefish, ornate ghost pipe fish, decorator crabs, nudibranches, shrimps, and frogfishes if you are lucky. After a while, you’ll hit the reef again where you can spot eagle rays and manta rays on lucky days. After a stop around Yangeffo, we’ll continue the trip for our last dive of the day in Gam. The famous citrus ridge, a very fishy dive site to see stunning coral garden, yellow soft corals, schooling barracudas, sweetlips, tunas, Spanish mackerel, nudibranches, pygmy seahorses, frogfishes, and others. Next, we take a trip back to the east part of Dampier Straight, directly to Waisai to load up food and water supply. Day 6, We will wake you up at 04:45 for small breakfast and take you with the boat around 05:00 to watch the birds of paradise. Then, we have a big breakfast and a break before diving the famous Blue Magic, close to the island of Mioskon. On good days, this submerged reef has 5 meters visibility because the whole dive site is covered with schools of fish. We can also encounter the oceanic manta rays here. For the second dive we move to Sardine reef with submerged sloping coral reef which should be dived in current. Otherwise, there is no fish around. It’s very good for big stuff as you’ll see school of fusiliers, rainbow runners, barracudas, sweetlips, giant trevallies, Spanish mackerel, grey reef sharks and much more. If there is current, you can get loads of hunting action and hear underwater thunder when the small fish move fast upon the tunas strike the bait ball. Then, we move down to Kri Island again to visit the homestay and trek the amazing viewpoint over Mansuar Island. You can just bring snorkel gear if you don’t want to do the trekking and later we do our third dive of the day, a night dive on the Yenkoranu Jetty. It’s a coral sloping reef with sand and bommies in the beginning and more reefs later which is very good for macro. There are pygmys seahorses, bobtail squids, pipefish, walking shark, mandarin fish, octopuses, cuttlefish, and even sleeping turtles on the reef to see there. Day 7, we’ll have an opportunity for one dive in the morning. Since this is going to be our last cruise day, you’ll have a plenty of time to dry your equipment on the way back home. Normally our guest always want to go back to blue magic again or different dive site around Kri Island. On our way back, we will do a final briefing, exchanging emails and photos, and say farewells to the crew. The crew will organize a transportation to your hotel. This itinerary works for a normal 7-days route. The cruise day can be extended to 10-days cruise with some other diving sites to visit in Misool Island. There are numerous spectacular diving sites you may explore during our diving cruise. All of those marvelous diving sites are situated around some famous islands in West Papua. Day 2, We move to the other side of Kri island and dive the famous chicken reef (Karang Ayam). It’s a submerge stunning reef and is good for big stuff, like tunas, Spanish mackerel, grey reefs sharks, white/black tip reef sharks, wobbegong sharks, and big schools of fish. It’s best to dive in when it has current bringing lot of hunting action. On the second dive, we’ll move closer to the world famous cape Kri, where schools of barracuda, jackfish, batfish, snapper, small reef fish, rays, sharks, turtles, and groupers, as well as the coral itself, are out-of-this-world. For the third dive, we move to west of Mansuar to dive the Jetty of the Sawandarek village, a protected dive site with stunning reef and good for pygmy seahorses, nudibranches, common octopus, and wobbegong sharks. Just under the jetty we can see schools of jacks. Next, we move to the west part of Dampier Strait to visit Abrorek Island, in the Dampier strait between Gam and Mansuar. We will visit barefoot conservation to get information on where the mantas is hanging out so we know where to go the next day. Day 3, We’ll only have about 15 minutes to manta sandy/manta ridge from Arborek Island. Manta sandy is one of the more famous manta dive sites in Raja Ampat, where you can see 4-5 mantas cleaned at the same time. We will dive manta ridge if the tide falls, to see a big amount of mantas hovering a couple of meters away, get fed by plankton carried by the strong current. We’re heading more west to Penemu and Fam Island aiming to dive the famous Melissa garden, you will see the best hard coral reef in Raja Ampat for sure. The site is named after the diving pioneer, Max Ammer’s daughter and is rich of underwater biodiversity: thousands of tiny reef fish, black tips, wobbegong sharks, pygmy seahorses, and much more. For the third dive, we move to Kerou Channel which can be a great drift dive if we get a little bit of current. It features a very nice reef, huge sea fans, and wonderful soft corals which are very good for macro. Yet, some bigger stuffs can pass us out in the blue. Finally, we’ll trek to Bintang Lagoon viewpoint, after we are done we start do a 6-7h night crossing up to the north to Kawe Island, one of UNESCO’s world heritage sites. Day 5, We’ll go for another wonderful dive in Alyui Bay, starting the morning dive at chanel #5., a dive site with nice swim throws among the big rocks, big schools of sweetlips, and fusiliers. White tip sharks sleep under the big rock, and pygmy seahorses are here and there. Here, we can also encounter dolphins, so keep out looking for them upon going up to do our safety stop. Then, we move to Yangeffo Islands for our second dive which was an exploration dive for our cruise director, when he worked for his old company. The site was so good, a great mix of macro and bigger stuff, that make us keep coming since that moment. Getting a sloping reef down to 15 meter, continue drifting until hitting the sand area where you can see flamboyant cuttlefish, robust ghost pipefish, ornate ghost pipe fish, decorator crabs, nudibranches, shrimps, and frogfishes if you are lucky. After a while, you’ll hit the reef again where you can spot eagle rays and manta rays on lucky days. After a stop around Yangeffo, we’ll continue the trip for our last dive of the day in Gam. The famous citrus ridge, a very fishy dive site to see stunning coral garden, yellow soft corals, schooling barracudas, sweetlips, tunas, Spanish mackerel, nudibranches, pygmy seahorses, frogfishes, and others. Next, we take a trip back to the east part of Dampier Straight, directly to Waisai to load up food and water supply. Day 7, We’ll dive at Blue Magic, to see an underwater pinnacle with various fish species and several cleaning stations on its top. Diving the depth, you’ll find bigger schools of fish and larger predator fish, such as sharks and manta rays. Pygmy Seahorse and big schools of barracuda are also common to find here. Then, we’ll continue our trip to Mike’s Point, seeking for some interesting humps, bumps, dips and walls. You can enjoy both hard and soft corals as well as finding pigmy sea horses, turtles, wobbegong, and nudibranch. For the third diving of the day, we’ll take you to Otdima, an amazing submerged reef which is best to visit during falling tide. Day 8, We’ll go up of the islands and dive the challenging dive site within the mangroves called: The passage. It boasts strong current and shallow site, hunting for flatworms and other colorful nudibranchs. After The Passage, we’ll be heading back to Dampier Strait,. Our second dive will take place in Sardine reef, where you can see tons of sharks: Grey Reef Shark, White Tip Reef Shark, Black Tip Reef Shark, and Wobbegong Shark. Next, we’ll anchor around the bat island Mioskon and do a beach visit. After a beach visit in Mioskon, we’ll spend the night around the island. Day 9, we’ll have an opportunity for one dive in the morning. Since this is going to be our last cruise day, you’ll have a plenty of time to dry your equipment on the way back home. Normally our guest always want to go back to Blue Magic. On our way back, we will do a final briefing, exchanging emails and photos, and say farewells to the crew. The crew will organize a transportation to your hotel. Day 1, We will meet you up in Sorong and take you to the boat, depending on your departure site, whether you leave from Sorong or Waisai. If you leave from Waisai, then we will take the ferry.We will do a 18-20h crossing down to Misool if we start from Sorong and if we start from Waisai we will do our check dive in Mansuar island and then do an 18-20h crossing down to Misool. Day 2,We are going to start doing our check dive in Wagmab or Gamfi. Then, we’ll dive at Farondi Cave, a dive site characterized with shallow soft coral reef, long sloping tunnel, and bottom covered in white sand sea fans and barrel sponges. This brings an ideal habitat for Tiger Shrimp and unusual Signal Gobies. At Farondi Cave, divers can expect to see stalactites and other unusual limestone formations covering the arching ceiling. We’ll end the trip at Wagmab, or the three sisters, before moving to the south east. Day 3, Chasing after Yellowtail Fussiliers and other sea critters at the No Contest dive site will be an opening of our diving activities on the day. Then, we will take the next diving at the Two Tree Island. Two Tree Island is very famous for Mobula rays hunting big bait ball of anchovies since it boasts abundant schooling fish. Finally, we’ll do the last dive at Baby Rock with full of thousands bait fish. At the end of the day, we are moving to south over a night crossing. Day 4, We’ll take the first dive of the third day at the Shadow Reef, a famous dive site to encounter manta rays. Shadow Reef is a submerged seamount south of Boo where various fish life in all sizes. You can expect to see baby white tip reef sharks sleeping under the table corals, schooling barracuda, and batfish. Manta ray may be seen circling the cleaning stations if you are lucky. After Shadow Reef, we’ll continue the journey up North West, taking Boo window as the second dive site. Boo Window is one of the most famous dive sites due to its unique topography. Here, you may see patrolling sharks such as Wobbegong Shark under the coral table. Within good current condition, we’ll move to the pinnacle, which is often surrounded by schools of fusiliers and plate-sized Batfish. Our third dive will take place at the huge island of Yilliet, stretching east to west, becoming a home to shark finning camp, Barramundi cod, Hawksbill Turtles, and schooling barracuda. At the end of the day, we’ll move down to the south west. Day 5, We’ll start our trip on day 4 around the Fiabacet chain, to visit the Nudi rock, which get its name since it looks a lot like a nudibranch from a distance. It is a favorite dive site for critter enthusiasts and macro photographers. You’ll have a chance to see numerous nudibranchs lurking among the soft corals. The sea fans here are the house for pygmy seahorses and cowries, shrimp and cling fish. During good current, we’ll go around pinnacles crowded with larger pelagics, such as Barracuda, Big Eyed Travelly, and Grey Reef Shark. After the Nudi Rock, we’ll continue the trip to the Tank Rock and finally to the final dive taking place in whale rock. Expect to see a healthy fish life, pygmy seahorses galore, nudis, colourful anemones, reef sharks, and perhaps a Wobbegong shark. Then, we’ll move to west, do a crossing from Fiabacet make the all way to Wayilbatan. Day 6, At the Wayilbatan Four Kings, we’ll do the first morning dive of the day. Then, we’ll visit Baracuda rock, one of the most famous diving sites in Raja Ampat known for its schooling Barracudas spotted around the reef. Our last diving site is the Wedding Cake, to see marvel at the overhangs and bommies within the dive site. The boat will take you back a little bit to north east, aiming at the Wayilbatan Chanel. Day 7, Starting the day with a diving at Fantasea or Wayilbatan chanel, which is not much about the fish, but more about coral, especially sea fans. Then we’ll take you to the Yilliet Kecil, a cool dive site near the Yilliet Island. Afther Yiliet Kecil, we’ll take about 15 to 18 hours crossing from Misool to reach Melissa’s Garden. Day 9, we’ll move to Cape Kri at the Northeast point of Kri island. Here, divers can find huge schools of big-eyed trevallies, barracudas, and snappers. You’ll also have a chance to see a dense school of sweetlips around the bommies. Grey reef sharks, groupers, pygmy seahorse can also be seen on this surprising dive site. Dawn and dusk are feeding time which means divers can witness an awe-inspiring diving moment. Our second dive will take place in Chicken Reef (Karang Ayam) in the northeast of Kri Island, characterized with various soft and hard corals and some rock formations with numerous schooling fish to see. Next, we’ll explore Sardine Reef, in the north-east of the island of Kri in the Dampier Strait, a large underwater pinnacle, with great schools of fish block out the light: jacks, tuna, trevally, and wobbegongs and grey reef sharks. At the end of the day, we will do trekking on Kri Island. Day 10, we’ll have an opportunity for one dive in the morning. Since this is going to be our last cruise day, you’ll have a plenty of time to dry your equipment on the way back home. Normally our guest always want to go to blue magic or different dive site around Kri Island. On our way back, we will do a final briefing, exchanging emails and photos, and say farewells to the crew. The crew will organize a transportation to your hotel.